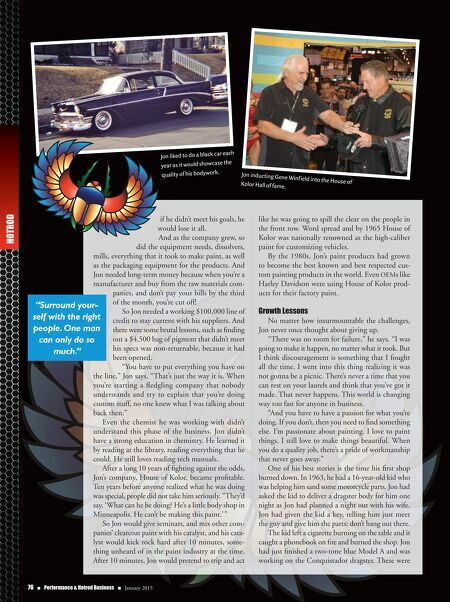 January 2015 n Performance & Hotrod Business n 77 ruined along with his chopped '58 pickup. He used this experience to better his business, buying the building he still uses and owns today. Being in a better and larger building was a boon for the com- pany's growth. He built a 20-by-15-foot addition on the back of the original structure, just for manufacturing and quickly outgrew that. He bought a building next door and added 5,000 square feet. Yet he still wasn't sure it would work out. He put posts in the floor, just in case he needed to turn it into a body and collision shop. "You never know where life will take you. So it's good to have a plan B. But keep working at it and hope for the best." Survival Lessons Jon's best advice for new or struggling businesses? "Surround yourself with the right people. One man can only do so much. I started with four employees and grew to 27 before I sold the company to Valspar in 1997. I had some very good people, but I went through a lot of people to get those key employees. You have to be quick to judge if that person is pulling their own weight or is taking money from the com- pany and is not an asset. And remember, time is money. When you're billing 40 hours a week, you're lucky to get 35 bill- able hours out of a person because there's so much time wasted, looking for this, looking for parts, and it's unfair to bill a customer if things aren't in place. It's important that your people understand that they have to be productive. Work cannot accumulate in the shop;77 there's no money in that. You're paying for that square footage and it has to be used. "One problem that can hurt a business, I call it a case of 'executivitus.' They, all of a sudden, now have a business and they think they're executives. They sit back and think they'll just watch the money roll in. Well, man, once you've got things laid out on there, you've got to work hard, and it's not an eight-hour job. You talk to any- one in business that works less than 14 or 16 hour days, I wanna meet them cause they're not gonna survive. It takes that Jon with one of the many motorcycles he's built and painted. kind of commitment to put those kind of hours in to survive. And weekends, too. I mean, you don't get any weekends off when you start a business. It just requires everything that you've got, 100 percent." When it comes to dealing with custom- ers Jon advises keeping the communica- tion channels open, explaining to them exactly what they are going to get. "They have to have some faith in you and your work. I put everything in writ- ing and get their signatures. Or, if I have to do a job in a way I don't agree with, I do not guarantee the job and they have to initial that fact." Jon feels the biggest thing for survival and the reason that most businesses fail is they're under-capitalized. "They don't realize what it takes and that's why many businesses start out of the garage, because that's what they can afford. And they have to build up and make their mistakes in a smaller way, so they can grow and understand what it takes to get that cash flow growing. Understand your costs. Understand how fast the money goes or where it goes and how you're going to get your payback. Make sure you make money on everything you touch. There's your heat bills, light bills, permits you have to go through in order to be in business. People don't realize all the rules and regulations that they have to abide by. Many busi- nesses have been put out of business by their local government, because they didn't have the money to do it right; to go in and play by the rules. "And you have to be good at what you do. And fast. You can't go in there and plod along and take hours upon hours to do something if there's a faster way. After a job is completed, be thinking, 'How could I have done that job better and faster? Would a different tool or machine help me?' You really need to have a fire in your belly when you go into business. You need to be hungry and need to stay hungry. Be aware of your competition and beat them at their own game." JoAnn Bortles is an award win- ning custom painter, airbrush artist, welder/fabricator, tech writer, and photojournalist with over 30 years of experience in the automotive industry. She is the author of seven books on automotive, motor- cycle, and custom painting. Her work has been featured in numerous automotive and motorcycle publications, NBC News, The Today Show, MuscleCar TV and Motor City Masters. She also serves on SEMA's SBN Select Committee. 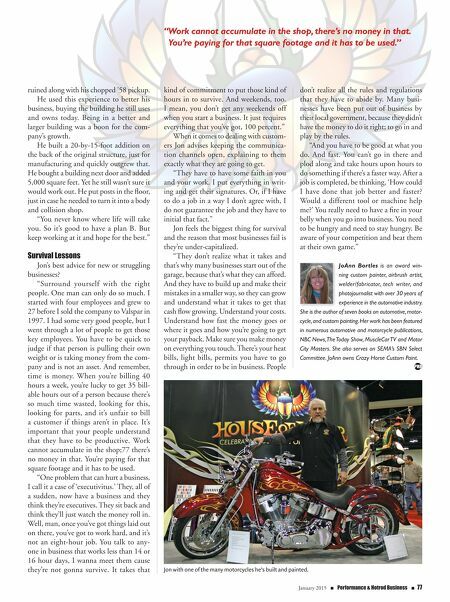 JoAnn owns Crazy Horse Custom Paint. " Work cannot accumulate in the shop, there's no money in that. You're paying for that square footage and it has to be used."